Playing peek-a-boo with the baby owl. cozied up to Katie's blue lights at night. Leaving behind a few feathers. Mama owl, maybe? In the front yard, a few feet from my door. 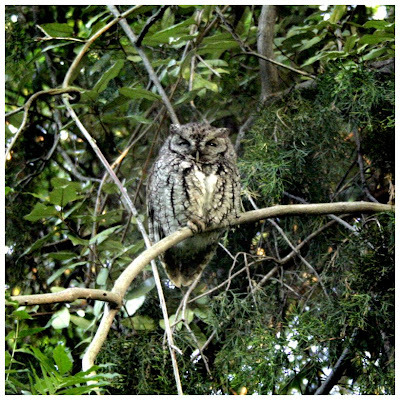 Even bigger owl, around the corner in the back yard. So a few less smiles for the missing owl, but continued smiles for these. 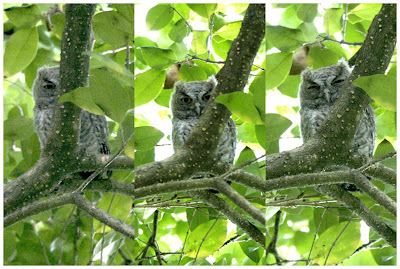 this is amazing that you have so many owls in your yard and in view for photographing. 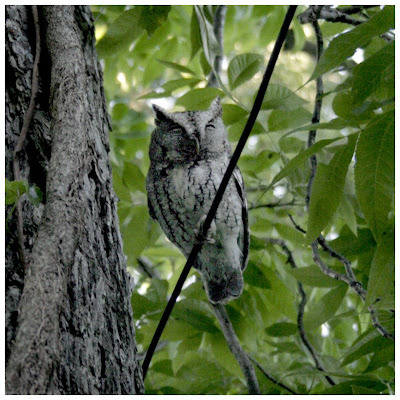 i can hear owls at my house but have never seen them close enough to photograph. I want to take this time to thank you for your recent comment on my blog. to hear you say it is amazing means more than you know - i am constantly amazed and inspired by visiting you. i realize we all get busy and certainly can not comment on all those that we visit. i am as guilty as anyone. i was just at the point, that night, the lack of comments from certain folks frustrated me, making me feel like i wasn't worthy. silly i know. i'll get back on track soon. thanks for your support. Owls are such amazingly beautiful creatures. Hearing one here in the city always catches me by surprise. Ok, this is just not fair. I check my trees in the back yard and there are NO OWLS! Geez you're so luck. What amazing shots. what an amazing moment you have captured! lucky you, and us to share the view! i am completely awed by these pictures and words. Owls truly are wise...at least the ones you see. They know exactly which neighborhood to reside in. So sad for the missing owl. There is something so magical about an owl. They are another ordinary miracle, aren't they? ...the sweetest photos of your little owl. Sorry to hear the fate of its sibling. Beautiful narration...(funny through the sadness is nice).